I made Ruby for Haley. The yarn is Lion Brand Microspun 100% micro-fiber acrylic in Ebony (153) and Lily White (100), and Patons Brilliant 69% acrylic / 31% polyester in Radiant Red (4942). They were knit on size US 3 and US 6 needles. I made the 3-6 month size and she’s 5 months old now. 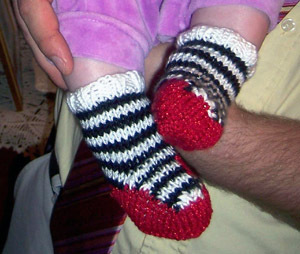 They look a little stretched in the picture because we tried them on over the socks she was already wearing. I’m not sure how I feel about the finishing on these. I might redo it.